My first introduction to ravioli was as a child. It came out of a can - pillows of slimy creamy stuff (which I later discovered was 'pasta') containing some brown paste, all swimming in a sweet orange tomatoey sauce. Needless to say, the real thing is infinitely superior. Most recipes will call for the use of Italian tipo 00 flour. I can't get that, so I use ordinary plain white (all-purpose) flour, which works just as well. Add the salt, eggs and olive oil to the flour and mix well. The dough will be very stiff. If it's too stiff, add a few drops of water, but be careful not to overdo it. Tip the dough out onto a floured work suface and knead it for 10 minutes until smooth and elastic. Wrap the dough in some plastic film and put it in the fridge to rest. FInely chop the onion and sauté it in the oil on medium heat until soft. Turn up the heat and add the meat to brown all over. Then add the tomato puree, basil and pepper and let it cook on low heat for a few minutes. Taste for seasoning and add salt if necessary. Remove from heat and put it in a blender. I use my stick blender for this. Give it a few pulses until the filling has the texture of a coarse paste. Put in the fridge to cool. If you have a pasta machine, hurrah! Follow the instructions for rolling out the pasta - it usually involves several passes through the machine, reducing the gap between the rollers each time you do it. If you don't have a pasta machine, roll up your sleeves and get out your rolling pin. On a floured surface, roll the pasta as thinly as you can. If you find it keeps shrinking back after you roll it, put it in the fridge to rest for 10 minutes then try again. Eventually, you should have a sheet of pasta about 1mm thick, and forearms like Popeye. Ravioli can be square or round. I find it easier to use a small circular cutter. Cut as many discs as you can from the sheet of pasta. Stack up half of them (these will be the 'lids') and cover them with a clean cloth to stop them drying out. Place a teaspoon of the filling on each of the remaining discs. Now take one of your 'lids', moisten the edge with cold water and place over a disc with the filling on. Press down the edges to make a good seal, then pick up the raviolum and fold the edge upwards slightly. Place on some kitchen paper to dry. When you have made up all of your ravioli, place then on a tray and cover with a clean tea towel. Put them somewhere warm to dry out for an hour, turning them over halfway through. Bring a pan of water to the boil - it needs to be deep enough to just cover your tomatoes. Cut the skin of the tomatoes in a cross running from top to bottom. Put the tomatoes in the boiling water for two minutes, then remove and cover them in cold water. When they are cool enough to handle, you should be able to pull the skins off without any difficulty. FInely chop the onion and sauté it in the oil on medium heat until soft. Coarsely chop the tomatoes and add them to the pan. When they have cooked down a little, add the tomato puree and basil. Cook for a few more minutes, then transfer to a blender and whizz into a smooth paste. Pass through a fine sieve, using the back of a spoon to force all the liquid through. Return the sauce to the pan. If you have any filling left over, you can add it to the sauce if you like. Taste for seasoning and add salt if needed. Bring a large pan of salted water to a rolling boil. Add the ravioli and cook for about 5 minutes. They should float to the top when they are ready. Drain and serve with the sauce and a salad. The video above is from the Keef Cooks YouTube channel. 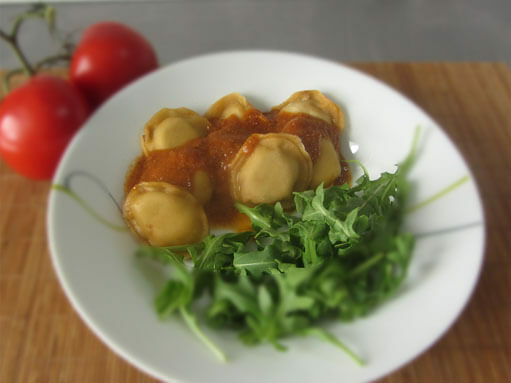 Click here to see the video recipe of Meat Ravioli on YouTube. Prep time: 40 minutes. Drying time time: 1 hour. Total time: 2 hours 5 minutes.